America's favorite do it all spray, WD-40, introduces a newly designed alternative to their classic aerosol spray can. The new non-aerosol design is said to allow for more spray control; anywhere from a few drops to a steady spray. The Trigger Pro is also not bound by aerosol disposal regulations. I guess now it can technically be taken on airplanes; just not in your carry on luggage. Don't blame me for getting arrested if you do. "Millions of people use WD-40 to maintain and repair equipment, but some of our on-the-job users work in environments where aerosols are prohibited. Some also prefer the unique attributes of a non-aerosol product," said Tim Lesmeister, vice president of marketing for WD-40 Company. 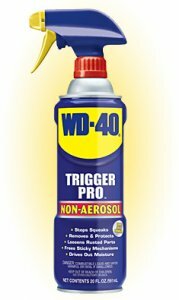 "WD-40 is committed to providing its industrial end-users innovative solutions and options, and WD-40 Trigger Pro gives them what they need to get the job done."